5-1/2" (140 mm) ergonomic versions for those who prefer a shorter forcep. 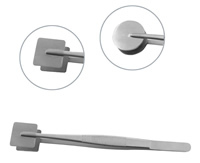 These forceps are available in Serrated/Straight tips, with either a 1.3mm or a 1.7mm tip width. 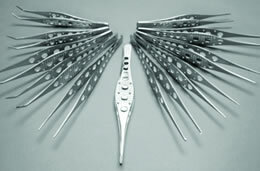 Made from stainless steel, 4" long.The forceps are delicate and the tips are serrated (1mm wide). Comes complete with a guide pin. Same as above but with 1x2 Teeth and they are extra delicate. Made from stainless steel and they are 4" long. The tips are 1.2mm wide. 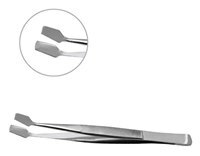 These forceps are delicate with a 6mm parallel platform. They are 4" long. And they are available with either straight tips or curved tips. Available with straight or angled tips with 5mm tying platform (parallel gripping platform). 4" long. 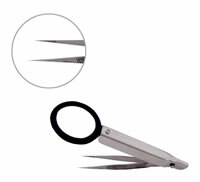 These forceps are angled with a 7.5mm tying platform (parallel gripping platform) and they are 4" long. 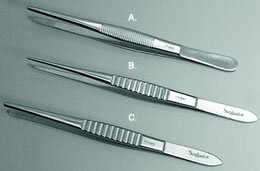 These forceps are available with straight tips and in 4 configurations. They are all 4½" long. These are very delicate forceps with a knurling handle and are 5" long. This outstanding design fits nicely into all hands with perfect functionality. 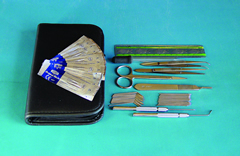 These forceps offer a light touch and they are non-slip and have high precision finish tips. They are the choice of all histologists. These ergonomic forceps come in 7 different configurations. 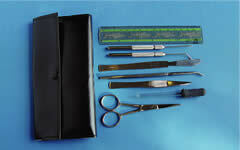 Vascular clamps or clips, stainless steel, serrated jaws. Magic Wands are made from PEEK, a high performance plastic, with excellent chemical resistantance and withstands high temperatures (up to 300°C). Magic wand is ideal for use for electronic high-tech areas to laboratories, from preparation of samples to applying adhesives, using it as a stirring rod, or even dosing samples, etc. Vinyl storage, zippered case with liner. Dissecting forceps 4.5" with guide pin, curved, fine points. Dissecting mall probe chrome, 6"
Dissecting forceps 4.5" with guide pin, fine points. Dissecting mall probe, chrome, 6"